Service catalogues are one of those service desk terms we've all heard of, but some of us do not have the time, resources or a clear idea of how to create, and manage an effective one. A service catalogue is a fundamental part of IT service delivery because it documents every service IT provides and builds service level agreements with your customers based on how these services are delivered. 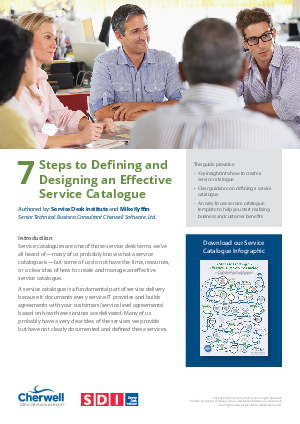 Download this guide and gain key insight into how to create a service catalogue, clear guidance on defining one, and an easy to use service catalogue template to help you start realizing the business and customer benefits.